浪人 (Rōnin) means “masterless Samurai“. When a 侍 (Samurai) lost his leader or master because of death or any other reason, he would either commit 切腹 (ritual suicide) or become a 浪人 (Rōnin). 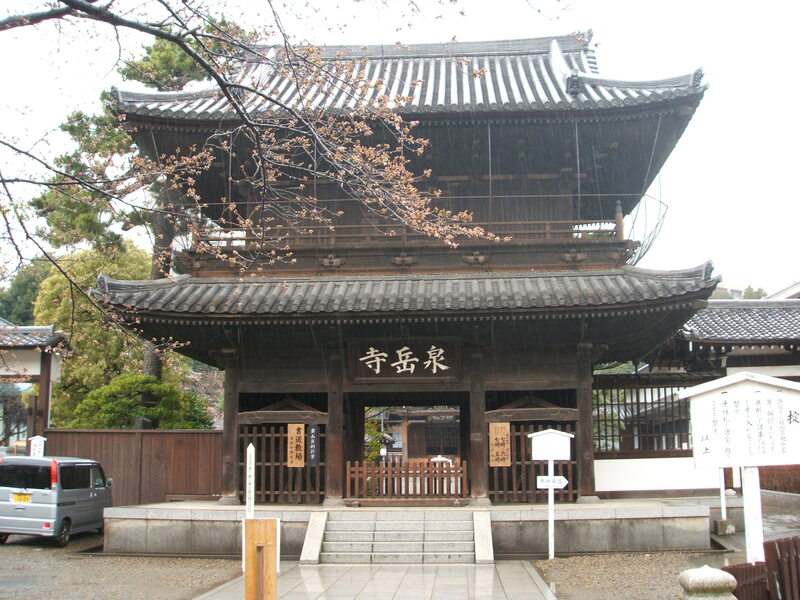 There’s a famous story of the 四十七士 (forty-seven Rōnin). The tale of the 四十七士 (forty-seven Rōnin) is a true story (probably embellished over the years). Basically the story is of a Samurai who unintentionally insults a higher-ranking Samurai. One thing led to another and finally the slighted, higher Samurai accuses the other of attempted murder…and he’s found guilty and forced to commit 切腹 (ritual suicide). 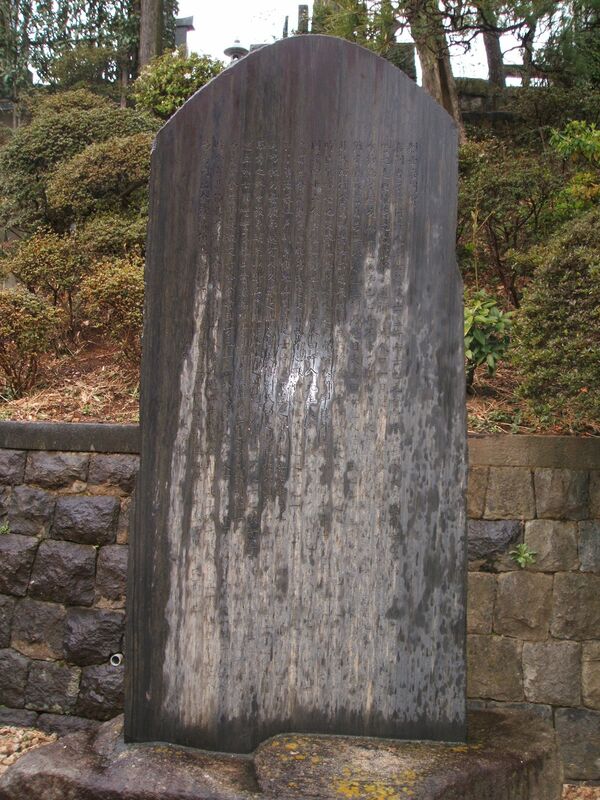 The higher ranking Samurai knew that the other had 47 Samurai who served him (who were now 浪人 (Rōnin)) that would surely try to avenge their master…so he surrounded himself with extra bodyguards to protect himself from their attack. The 四十七士 (forty-seven Rōnin) knew that they couldn’t kill the other Samurai with so many guards protecting him…so they did nothing for months. The whole town lost respect for them and mocked them as cowards. It was all a part of the 四十七士 (forty-seven Rōnin)’s plan…once the higher Samurai let his guard down because he no longer felt any threat from the “coward” 浪人 (Rōnin)—that’s when they struck! After they killed the man responsible for their master’s death, they all committed 切腹 (ritual suicide) to retain their honor. 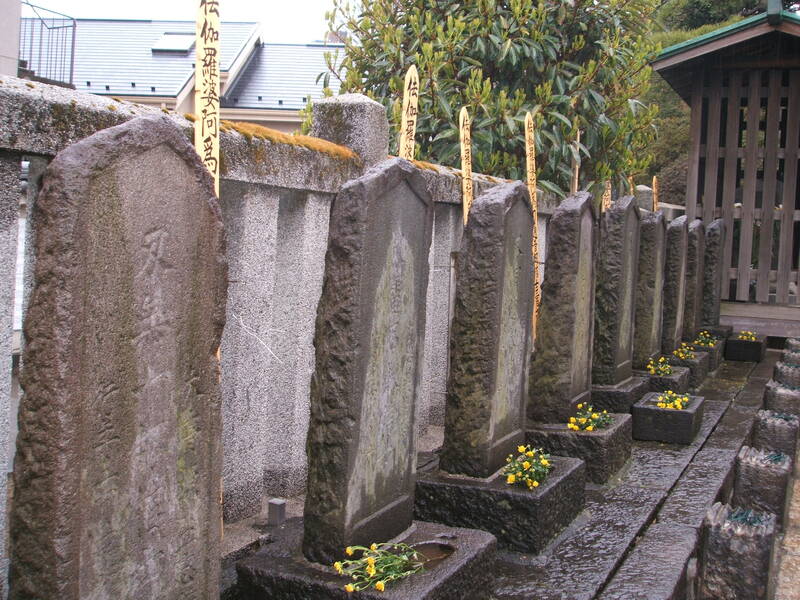 The graves of the 四十七士 (forty-seven Rōnin) is at the 泉岳寺 (Sengakuji Temple) in Tokyo. 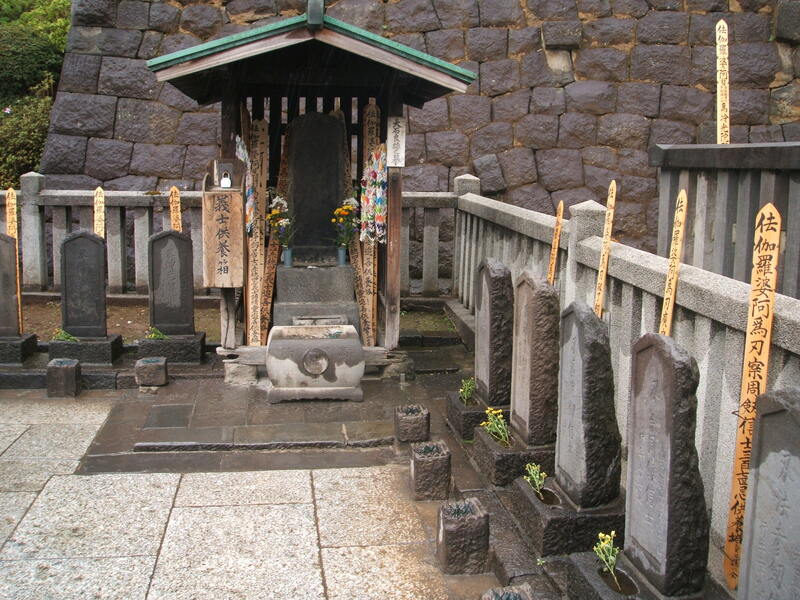 I went to the graves of the 四十七士 (forty-seven Rōnin) and took some photos. It was raining a bit today…I think the overcast, rainy weather added to the atmosphere. Not 泉岳寺...but outside the subway station. 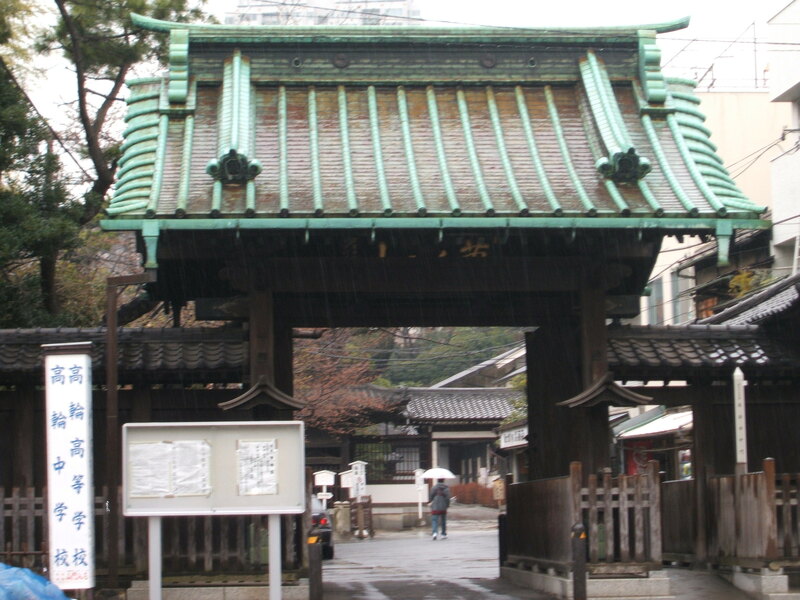 Entrance to 泉岳寺 (Sengakuji Temple). By the way, did you know that the American actor Keanu Reeves will star in the upcoming Hollywood movie to be titled “47 Rōnin” about this tale? Also, in modern Japan, the term 浪人 (Rōnin) is sometimes used to describe someone who’s failed their high school or college extrance exam and must wait a year to try again. I just watch the movie …………. one of the best movie in my life time … I am 44 in August and will surely visit their grave one day. Really? Was it that good? >(I) will surely visit their grave one day. I hope you’re able to! We are currently in Tokyo. We already visited Kyoto, Nara, Hakone and Mt Fuji. 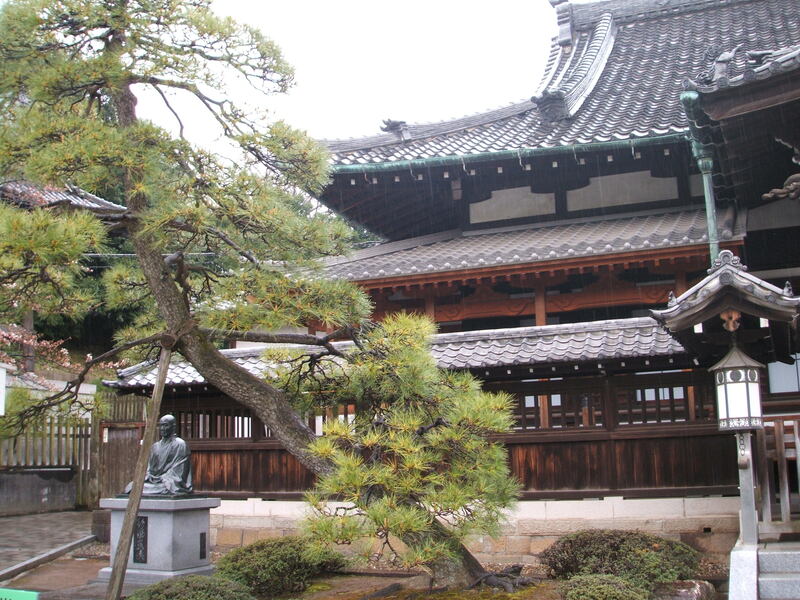 Thanks for the information on Sengakuji temple. You should make a blog with photos from your trip to Japan. Kon ban wa I am here in Japan enjoying this beautiful country. 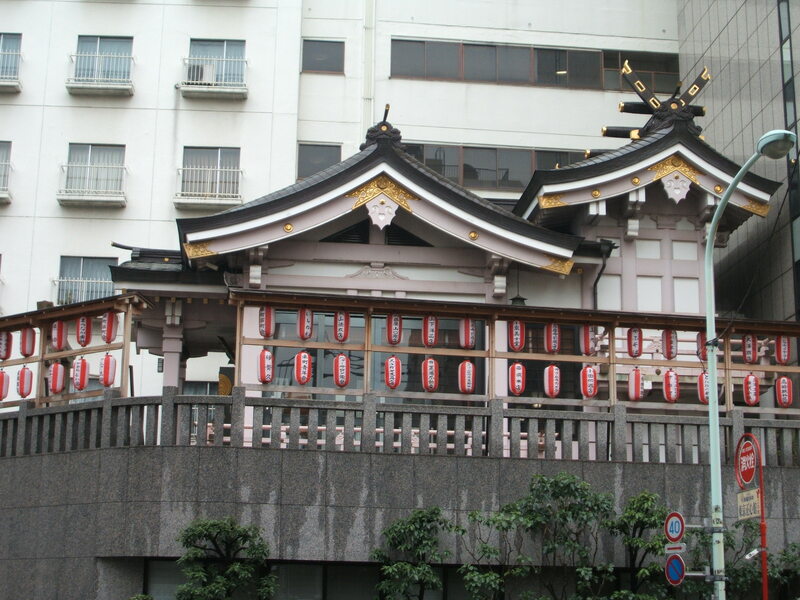 Is that temple located in Shinagawa? I thought your trip here must’ve started. How long will you be in Japan? The whole time in Tokyo? 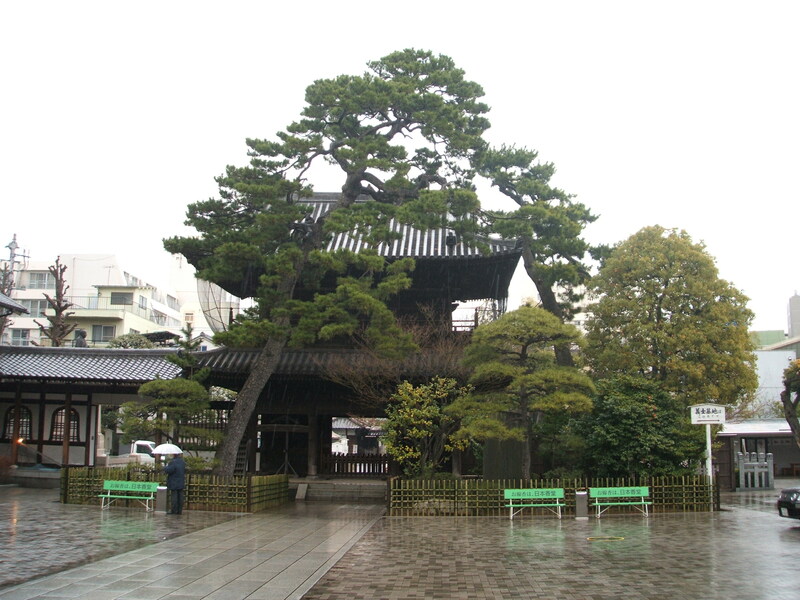 Sengakuji Temple isn’t in Shinagawa-ku, per se. 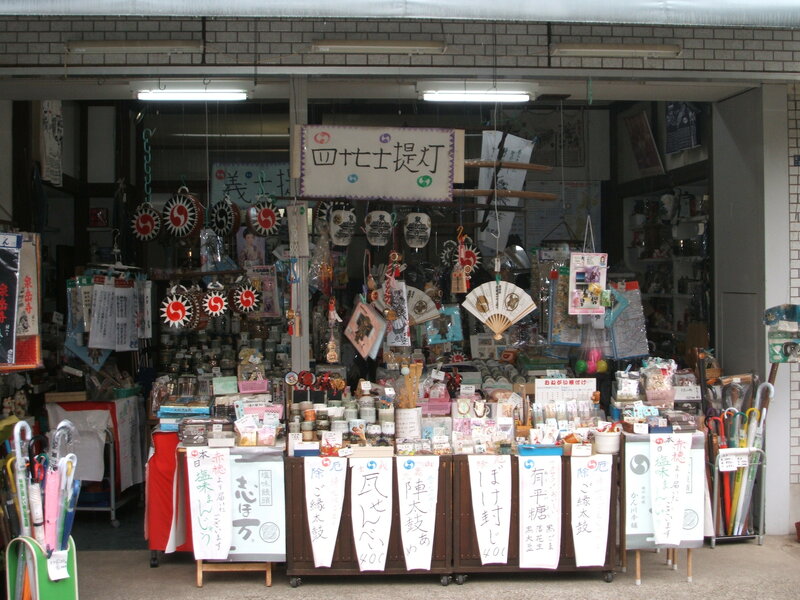 But it’s near 品川駅 (Shinagawa Station)…it’s even closer to 浅草線の泉岳寺駅 (Sengakuji Station on the Asakusa Subway Line). You can also get to Sengakuji Station from Shinagawa Station on the “Keikyu Line”…one stop. (From Sengakuji Station, exit “A-2″…go outside, turn right and walk straight. It’s very close). But I do agree it is a cool story. I think a movie of it is a great idea. I am not so sure about Keannu Reeves though. He’s ok but for this part? I guess no matter who they cast, some people will be critical of a Hollywood version of this story. I like the story of the 47 Ronin. 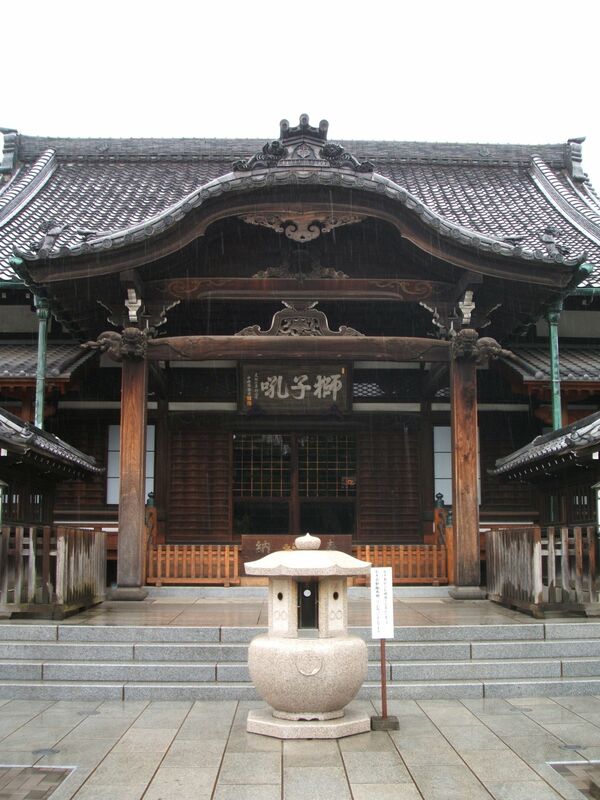 However, although they are honored for their samurai bushido, it can also be interpreted in another way. Their lord could be looked at negatively for giving in to his temper and striking out at the Shogunal representative who he felt insulted him. He also did this in the confines of the shogunal governmental building (Edo Castle?). He also acted without thinking of his consequences such as the loss of his domain and what would happen to his loyal samurai who would then become ronin. Also, the ronin did not imediatel commit seppuku upon completion of their act of revenge which would seem to be what they should have done. They returned to their compound and when confronted by the shogunal authorities, the ronin asked to be pardoned. When they werew denied, they were sentenced to commit seppuku which they did. 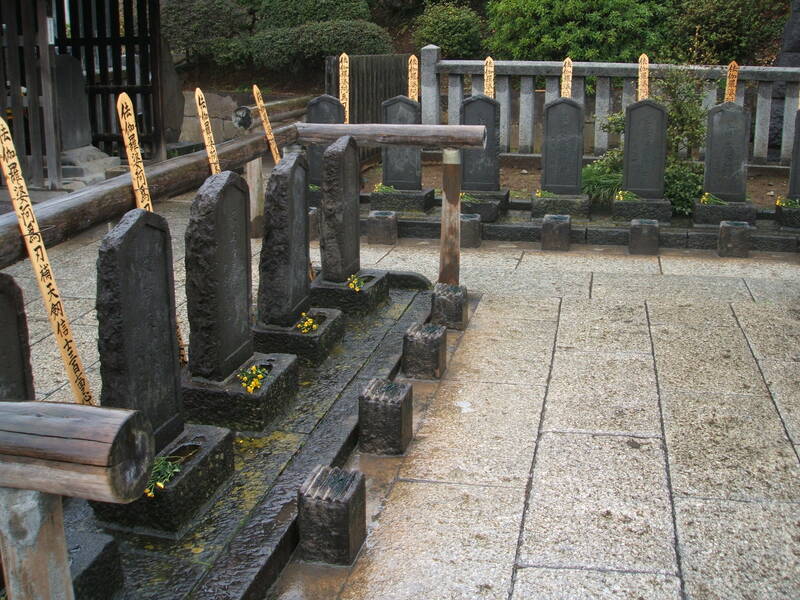 I read the story of the 47 Ronin as you described but I only wrote a summary of it in this post. Thanks for adding more details! Like Robin Hood, Billy The Kid, etc…I’m sure the story of the 47 Ronin has become embellished over time. My camera is only a small Fujifilm “Finepix”. Nothing special. Are you a Keanu Reeves fan? Actually, I was surprised that he was chosen to star in 47 Ronin….just like I was surprised that Jackie Chan is going to be in the Karate Kid remake! Well for a small camera it sure takes great photos, Im using a canon a360 ..tiny fat lil thing but i love it. 😀 I am a fan of Keanu Reeves but a bigger fan of Johnny Depp. I just hope he will portray the character very well, to me, movies based on epic history or legend or mythology should be created to its utmost details. I always find movies based on books or what Ive just mentioned a disappointment but I cant complain too much. I hope he will prove to be the right choice for this part! I cant wait! Jackie Chan as the next Mr Miyagi? I agree with you in your Karate Kid blog. I hope he can portray Mr Miyagi’s character to a T because i watched those KK movies except for the other one and I am very fond of Mr Miyagi’s sweet helpful philosophical character. I always see Jackie Chan as more of a humorous man. And yes why film in China? No disrespect to Jackie Chan and China, its like Memoirs of Geisha ..all 3 actresses were Chinese. I am sure there are many talented Japanese actors & actresses. >I always see Jackie Chan as more of a humorous man. Actually, when they were casting for the original Karate Kid movie in the 1980s, some people didn’t think Pat Morita was a good choice for the same reason. The story about the 47 Ronins are one of my favorites. Of course Ive also marked this place as one of my MUST GO SEE places when I make my plans to visit this beautiful country. My dad used to play videos of Japanese movies about samurais and ninjas ..although we do not understand we were lucky to have subtitles my dad would be telling us more in details about whats this and that. We always got excited when he comes home and plays another Japanese old movie for us. Keanu Reeves to star in the 47 Ronin? I did not know this *high school girl scream* now this I cant WAIT!! Thanks for sharing the photos. You take really good shots of them! What camera are you using? There’s also a scene in a Robert DeNiro movie where an ex-spy tells DeNiro the tale of the 47 Ronin. Now what was the movie’s name…….